Slightly larger than the NanoQube, the MicroQube is similarly diminutive but offers the advantage of being able to accommodate a PCI Express card, as well as being equally beautiful of course! The MicroQube offers an unbeatable blend of style and substance. At 5.6cm taller than the NanoQube and 7cm shorter than the MiniQube, it can accommodate a full-size PCI Express card and up to two 2.5/3.5in drives. 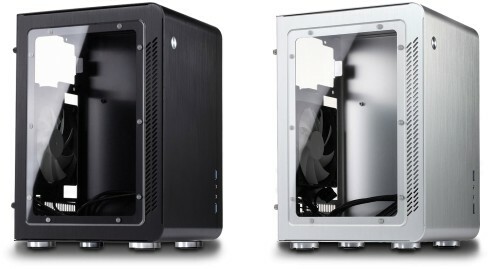 It uses a conventional fully-featured Mini-ITX motherboard. And because we offer the latest power-frugal processors, it is cooled fanlessly. The power supply is a fully integrated unit so there are no black "bricks" to have lying around behind the PC. 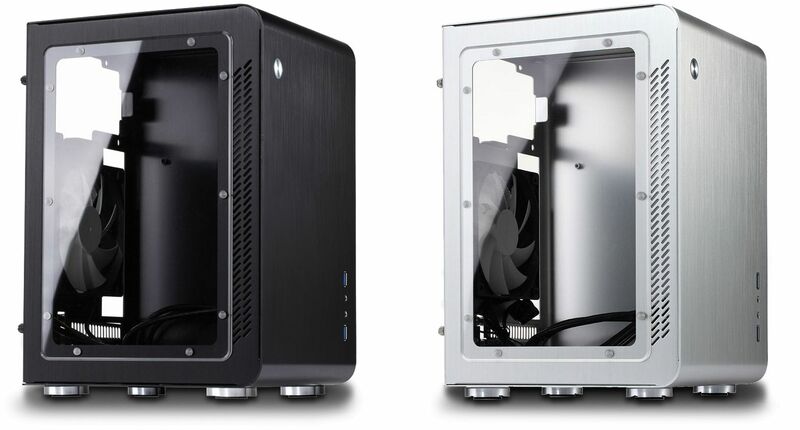 The PSU is semi-fanless, so its fan will only operate if its running temperature climbs to dangerous levels. In normal use there will be no noise, no dust, no moving parts and no maintenance. Because we use a fully-featured motherboard, the PC is a very capable unit. It can be built with up to 16 GB of memory and one of Intel's latest 4th Generation Core processors. Famous for their excellent performance/value balance, these 'Haswell Refresh' processors have a quad-core architecture and under heavy loading they will automatically "Turbo Boost" their clock speed by up to 12%. As well as Windows 7 and Windows 8.1, we also offer Ubuntu Linux as a low-cost pre-installed option, and like Windows, we would recommend a minimum memory specification of 4GB for this operating system to perform at its best. The price of many pre-built PCs these days is often supported by cash kickbacks from software companies who pay hardware manufacturers to pre-install limited or trial versions of their software and then hope that the customer pays to upgrade to the full version. The downside to this approach is that the new PC comes pre-loaded with a lot of "junkware" which bloats the operating system and can cause severe performance degradation. Here at Quiet PC, we believe that customers have every right to expect the best possible performance from a brand new PC, so every system we build comes with our Clean Build™ promise. We install the operating system (if you order one) with motherboard drivers, OS updates and (for Windows 7 only) Microsoft Security Essentials / Windows Defender - that's it. You won't be pestered by pop-ups and nag screens and you can get on with using your new PC immediately without having to uninstall lots of junkware first. Your new machine will boot in super-quick time and will stay running quickly for many months and years to come. We offer free hardware technical support for as long as you own the machine. This support covers any hardware query or problem, including advice on maintenance and upgrades. We regret we can't offer software support or training so we would recommend contacting the software vendor in this instance. Support for Ubuntu can be obtained through online forums, or on a commercial basis from Canonical Ltd.
Our hardware warranty runs for two years and is "collect and return" meaning that you don't need to worry about getting the machine back to us - we will instruct our courier to collect it from you on a day of your choosing, then after we have checked and repaired it we will send it back to you by express courier at our expense. In addition, unlike many other PC suppliers, we have an "open-case" policy which means you are free to open the machine and perform your own minor modifications or upgrades without worrying that your warranty might be affected.